August 12- August 20, 2017- I have not had time to update you all on the events that have been happening mainly because August is a whirling wind of Art Events! It has truly been a transformational-evolving- and learning experience to be very busy and adjust to standing outside in the public beyond my little art cave and home. Lotus & I's show and workshops have been phenomenal. Pure gratitude for all of those that have supported and showed up to the events to learn something new, gain deeper knowledge, or share their energies in our intentional art community. You all inspire me and I hope that I inspire you. August 12, 2017- An evening of colorful vibrant dancing-movement- art making- and connection. Lotus started out the workshop by leading us through an intuitive dance routine that allowed us to see shapes with our bodies. It was really cool because part of the time we were blind-folded! What an experience to share space with a group of people and be able to feel comfortable enough to dance with literally not even yourself watching! Within both Lotus & I's abstract paintings, we can find intuitive shapes and symbols and this exercise allowed us to see that these shapes manifest and transform with every movement of our physical form. After the dancing, I led our participants through a series of exercises that allowed them to break free of their analytical mind and enjoy the connection between paint and their bodies. We got messy- especially our feet- because we danced all over our canvas! A special thank you to everyone that participated in the workshop. Thank you for allowing my space to honor creativity- your openness and exploratory inner child. August 18-20, 2017- I managed to arrive at this festival with minor expectations. as an INFJ, I tend to stand in the middle between my idealistic vision of how the present should manifest and how it really does. It is a real struggle for me to just throw myself into the wind and see where I fall. But I did do just that with this festival. Lotus had invited me along to the festival because she had been invited to be a featured artist at the festival and wanted to bring her son. She had asked me if I could come along and help watch her son while she did a couple art things, which I felt was an opportunity for Cayce and I to join in and experience a new side of our Yoga and camping lifestyle. Lovelight also took this opportunity to add me to the roster of artists that were being featured. A special thank you to the art coordinator for allowing all the artists to display their talent and works. Lotus and I managed to get a good amount of painting in throughout the day and switch off live painting at the Main Stage at night. One of my favorite parts of having my paints with me was when I pulled out sticks and paint and 10 kids came over and did a impromptu stick painting workshop with me in the middle of the open field. It was pretty special and spectacular to share creativity with the kids. I was also glad that they were able to take their sticks with them and remember that special time creating. I taught them how to mix different colors and it amazed them that blue & yellow could make green...etc. Something about the festival that I really enjoyed was the openness, compassion, and connection that happened almost everywhere that I went. The festival has Kirtan music, healing Workshops, Kids Yoga, Flower Crowns, Vegan Cafeteria, Artists, Concerts, shops, and just ultimate relaxing within nature. I would say probably my favorite part of the entire festival other than camping with my soul fam was the impromptu drum circle that manifested on Sunday. Children, Parents, Young, and Old all joined in Kids songs, drumming, and dancing until we all separated and went about our ways at 11:11. I mention that time because if you follow mindful- intentional community, you would understand my amusement and excitement about the ever exceeding divine flow. 11:11 for me is always a reminder and a thank you from my intuitive self that we are flowing on high vibes. This festival was truly a continual reminder to connect deeper with my soul community as well as the practices and places that I truly believe I should be. I can only hope for future moments and spaces where I will find myself connecting together with people closely linked to my mind and heart. Being at the festival also reminded me that I need rest. I am personally, an extremely driven woman. My truest intention on this plane is to manifest change and healing in this world. Every part of my life whether it be peaceful parenting, studying to be a psychologist, or working hard to build an intentional art community, represents my vision of honoring the change that I seek. That being said, I cannot heal and change the world without also resting and honoring my own body. I cannot give you all the truest form of myself if I am constantly exhausted. Some of personal synchronicity transformed my beliefs I have and I plan on honoring more personal rest and self care. One of my spirit animals is the Bear and as you all know, although, deeply wise and exploratory in the woods or the arctic, a bear still needs time for hibernation and rest. I need to honor this part of me and I am going to take an active role in honoring it and integrating it better into my life. 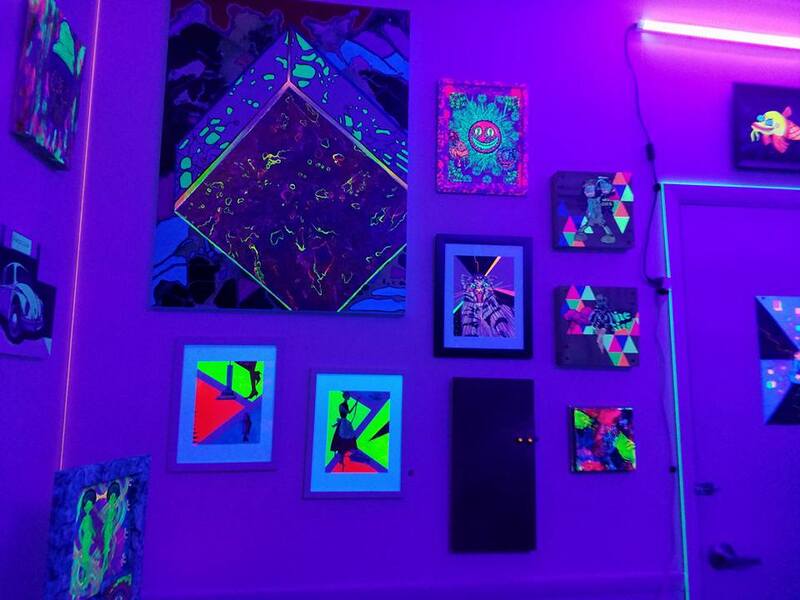 August 19, 2017- Although, I was at the Lovelight Festival for the closing reception- 3 of my paintings were still on display in the closing of Beyond the Blacklight. They lit up the neon blacklights for one last viewing of the art exhibition before de-installation. Three of my paintings that were installed in the show were a painting of my underwater fairdom called "Neon Reef" and two paintings of the primal creatures that I have been beginning to paint here and there. I really feel strongly connected to the primal techniques of our ancestors and sometimes just like to establish a deeper skill with those type of abstractions. I feel as if they invoke and deeper integration between our animal being and our spiritual soul. Tonight New Moon Meditation-Source Renewal with Lotus at Village Gallery- Our paintings are still on display- feel free to check out the closing reception this Saturday as well! Art Prints Available in my Website's Shop! 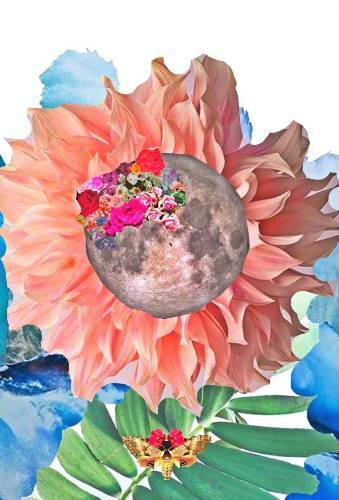 All of my moon collage art prints are available in my art shop- after the takedown of the Nameless Show, there will also be paintings for sale there, so please keep an eye out for art and if you are looking for something in particular, feel free to message me, so we can discuss. July 22, 2017- Can I just say, WOW! An Amazing show put on by Olly Olly! 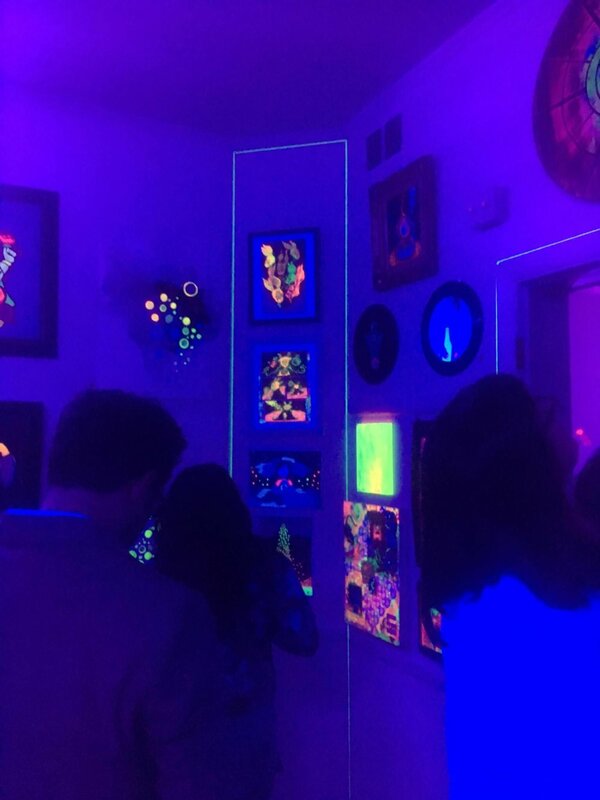 Beyond the Blacklight immersed us all into deep, dark, and wonderful lighting of the purple blacklight with beautiful glowing artwork from local artists all over the Northern Virginia Area. You can find the list on the Olly Olly website! Before I go on to rant about my thoughts on the artwork, I have to do a shoutout to all that came out to the show! It was packed shoulder to shoulder like a rabbits den and it stayed like that well past to the end of the show! WOW! Lots of amazing conversations could be overheard, great costumes and outfits that also glowed in the black-light, and even a nice dazzling thunderstorm from mother nature herself to send us all home. Much of the artwork that was on display reminded me sparkling dazzling luminescence of our own lights and how sometimes we can mistake our shadow selves as who we really are. But I have found on my own journey that the darkest times and darkest places will show you your truest light. There is no darkness that can shine out the light. The black-light, the caves, the depth of the deep sea itself only enhances our lights and that's just what this show did! The talent that oozes from the community around the Northern Virginia area is so incredibly inspiring. I am humbled every single day for the opportunity to connect with these amazing people. I managed to even paint and chat with some people who worked on the neon mural that happened during the reception! It was an ooey-gooey collaboration of love. Tariq Omar& Jessica Kallista, the curators of the show truly did a fabulous job of displaying the mystical magicalness of the glowey blacklight and the community sent lightning beams of love through my soul with all the support that came through. I exude with gratitude that I was invited into the show and had three pieces of art to display! Seeing them in the blacklight was a dream come true! I am looking forward to more events happening at Olly Olly and as always, you can find more press on the Olly Olly Facebook like the razzle dazzle video that was made about the opening! It truly feeds my soul to come out of my art cave and jump into a world where community, art, and raising the vibes of our world is the focus. I felt as if this exhibit brought to "blacklight" (hehe) our inner child and really illuminated our gigantic beautiful hearts. We all crave creative celebArtions such as these and really truly can't wait to dive deep into more. Overall, it is a magical exhibition that runs from July 22- August 19 and can still be viewed by appointment. I have done a slideshow of pictures of the exhibit. The main intention of these meditations will be to focus on the journey within. and continue to immerse ourselves into strengthening our community connections. As we approach the jewels within ourselves, I find it's a really cool way for us all to raise the vibes of community in our NOVA area. Next week on August 5th, we have my opening reception for my first solo exhibition with Lotus Heartsong, where we will be showcasing our solo and collaborative works as well as the music of my husband, Darius Twin and our dear friends, Shadow Farm. 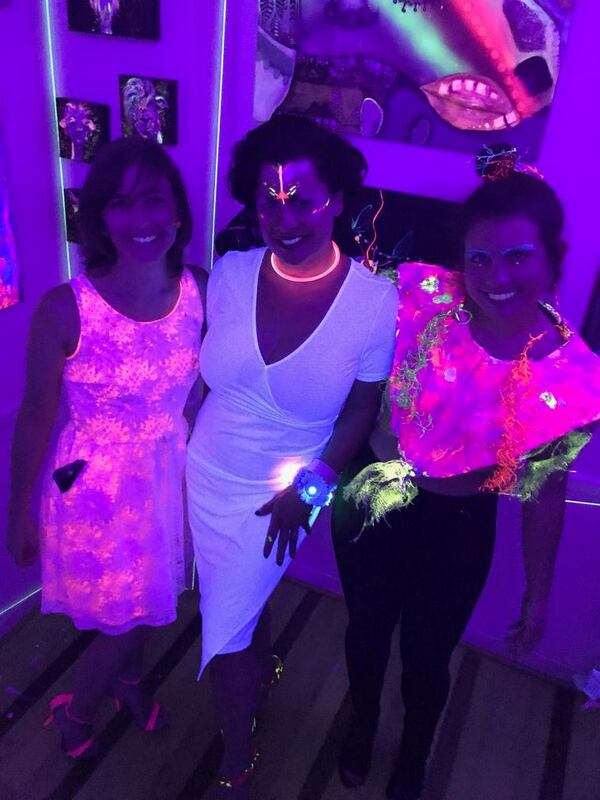 July 22, 2017- Beyond the Blacklight opening reception is happening at Olly Olly where we will all celebrate the joyfulness of the night. I have been accepted into this art show to showcase three of my best artworks in the neon purple glow of the blacklight. Looking forward to being side by side with so many talented and awesome Northern Virginian artists that are displaying works in this show. Founded in 2014 by Jessica Kallista, Olly Olly is a call for local artists to come out from their hiding places to make and show their art in a nurturing, creative, alternative art space. Olly Olly is also a call to the community to come out, support, and benefit from an art scene that helps our community prosper and helps to provide an authentic, art filled environment. Olly Olly promotes collaboration rather than competition and provides artist and writer studios, an incubator space, as well as a gallery, open studio, and VIP event space for the community. Olly Olly, located at 10417 Main Street, 2nd Floor in Fairfax, VA, is open for special events and by appointment. Please call 703-789-6144 for more information. Co-creators who share a studio together at Olly Olly in Olde Town Fairfax. They believe in intuition, higher mindful living, and creating. We were placed on this Earth to enjoy the beauty of this dimension. Thank you for blessing us with this space.